I am temporarily working at the Mediterranean Institute of Oceanography (MIO, Marseille, France) on a European-funded Marie Curie fellowship until June 2019, looking at the effect of tropical Pacific islands on phytoplankton. To read more about this, see my MIO webpage. My research combines satellite products, model outputs and in situ data to study ecosystem processes, from physics to top predators and carbon export with a stronger focus on phytoplankton. I currently work with several MBARI research groups (Chavez, Haddock, Robison, Smith). Topics include physical and biological variability at regional and global scales, response to climate and ocean change, links with higher trophic levels, bioluminescence in the upper ocean, and connections between surface, midwater and benthic communities. 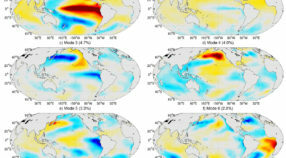 Global modes of climate variability defined from sea surface temperatures (1910-2009) and related to regional modes such as ENSO or the Pacific Decadal Oscillation (Messié & Chavez 2011). See the Global Modes webpage that includes plots and up-to-date global indices (updated monthly). Global-scale modes of variability in physical and biological variables (1993-2010), that capture synchronous variations associated with ENSO (first mode, Messié & Chavez 2012), and with ENSO Modoki and the NPGO (second mode, Messié & Chavez 2013). For a review of marine primary production in relation to climate variability and change, see Chavez, Messié & Pennington 2011. 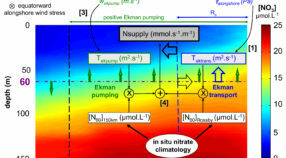 Nitrate supply calculations from satellite winds and in situ nitrate climatologies (Messié et al. 2009, updated in Messié & Chavez 2015). See the Nsupply webpage for a description of the method and to download data products. Seasonal regulation of primary production in EBUS based on nitrate supply and proxies for iron, light, temperature and physical export (Messié & Chavez 2015). This study showed that primary production regulation is highly variable in space and time and across systems. Zooplankton hotspots in EBUS, based on plankton growth/grazing equations initialized with nitrate supply and combined with surface currents (Messié & Chavez 2017, press release). For a comparison of the four major EBUS (California, NW Africa, Peru and Benguela), see Chavez & Messié 2009. Seasonal cycle of satellite chlorophyll and its drivers, found to be primarily changes in horizontal advection and local upwelling (Messié & Radenac 2006). Model analysis of a dramatic bloom observed during the 1997-98 El Niño / La Niña transition, which was shown to be generated by an island mass effect (Gilbert Islands, Republic of Kiribati) (Messié et al. 2006). A similar bloom was observed during the 2009-10 El Niño / La Niña transition (Gierach, Messié et al. 2013). 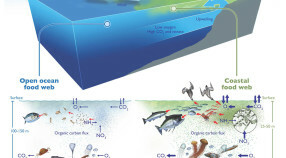 Description of a persistent oligotrophic zone found within the warm pool (Radenac, Messié et al. 2013). Such low chlorophyll values can be explained by a deep nutricline, the presence of a barrier layer and the remoteness of nutrient-rich areas. For a review of phytoplankton dynamics in the western tropical Pacific (seasonal variability, 1997-98 Kiribati bloom and westerly winds impacts), see PhD dissertation 2006 (in French). Impact of environmental conditions on sharks distribution and diving behavior. A method combining in situ nitrate concentrations and satellite winds provides estimates of nitrate supply in coastal upwelling regions (available for download). A century-long EOF analysis of global sea surface temperature (SST) identified modes associated with regional climate phenomena. Plots and time series are updated monthly. Biological Oceanography, Biodiversity and biooptics (bioluminescence), Integrated time series, CANON.